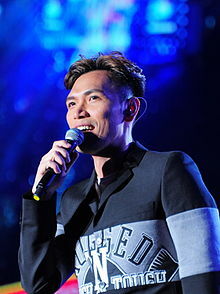 Aska Yang (traditional Chinese: 楊宗緯; simplified Chinese: 杨宗纬; Hanyu Pinyin: Yáng Zōngwěi; Tongyong Pinyin: Yáng Zong-Wěi, Born April 4, 1978 in Taoyuan City (now Taoyuan District), Taiwan) is a Taiwanese Mandopop singer. He graduated from the National Changhua University of Education (NCUE), with a major in Guidance and Counseling. During his study at NCUE, he attended singing contests and won some prizes. He is now studying a master's degree program in the Sports Psychology Department at the National Taiwan Sport University (NTSU). Aska Yang debut in Taiwan as a contestant on season one of Taiwanese TV singing contest One Million Star. He sang songs such as "再見我的愛人" (Goodbye My Love), "人質" (Hostage), "背叛" (Betrayal), "新不了情" (New Endless Love). "Broken Wings (多餘)" – theme song from the movie "Keep Watching (沈睡的青春)", and it is the first original song of Aska Yang. Later in the year, he was involved in a tense contract dispute with his manager, Hsu An-chin. Because of the press attention, his name was frequently mentioned in the entertainment news headlines, in a sensational way, throughout the whole year of 2007. For example, he was ranked second in "Person of the Year" by Yahoo!Taiwan and was also listed in a book called "Who’s Who in the ROC, 2007-2008". After reaching an agreement with his manager at the end of 2007, his musical career formally started. He released his debut solo album, titled Dove (鴿子), in January 2008, and it became the best-selling album in the first half of the year. The tracks "洋蔥" (Onion), "鴿子" (Dove) and "幸福的風" (Wind of Happiness) are listed at number 1, 5 and 12 respectively on Hit Fm Taiwan's Hit Fm Annual Top 100 Singles Chart (Hit-Fm年度百首單曲) for 2008. The track, "鴿子" (Dove) won one of the Top 10 Songs of the Year and "洋蔥" (Onion) won Best Loved Song by Audience at the 2009 HITO Radio Music Awards presented by Taiwanese radio station Hit FM. His fan base began to expand to other regions like Singapore, Malaysia and Hong Kong. Yang also played his first solo concert in Taipei Arena in May, just four months after the release of his debut album. However, after the solo concert, he was embroiled in conflict with his manager again. The dispute resulted in a sudden pause in his career. In October 2008, Aska Yang formally announced the termination of his contract. While attempting to resolve the outstanding contract issues by going to court, Aska restarted his music career in early 2009. He held a mini-concert in Taipei on 11 January and also began participating in other performance events, such as TV shows, concerts and musical plays. Outside the entertainment business, he enters the Graduate Institute of Physical Education of National Taiwan Sport University to study for a master's degree in Sport and Exercise Psychology. "Because You're Good To Me"
"You Don't Trust Me At All"
2007.9 : Voice of Taipei (Hit FM) Celebrity hand-painted Signature Net Cap Auction : Aska Yang’s fans club won the highest bidding and raised NT $200,000. The money was given to the Chinese Children Home and Shelter Association. 2007.9 : Aska Yang’s fans club donated the net cap to the Taipei Women Rescue Foundation (TWRF) for a live auction in the 20th anniversary of Appreciation Reception. The former chairman of TWRF, attorney Ying-Chi Liao, won the final bid of 300,000 NT dollars, and returned this monumental net cap back to Yang. 2007.9.15 : Aska Yang then offered the cap to National Changhua University of Education for collection. With Yang and his fans' help, TWRF raised a total of 1,290,136 NT dollars, on the day of the Anniversary Appreciation Reception. 2007 : Spokesman of the non-profit event "The Magic School"
2008-01-18 : Spokesman of the Public Traffic Safety Film Contest Sponsored by PBS Television in conjunction with Ho-Tai Automobile Manufacture. 2008-02-20 : Spokesman of Taipei Women's Rescue Foundation Charity Movie Premiere "Persepolis". 2008-05-17 : Star! Start! Solo Debut Concert at the Taipei Arena : Aska Yang donated his entire income to the victims of the Sichuan earthquake in China. 2008-06-21 : Taipei Women’s Rescue Foundation~ 10 years celebration of the Domestic Violence Legislation Act. 2008-10-06 : Aska Yang donated NT$500,000 to the ChuangHua Teacher’s University Alumni Association Scholarship Fund. 2009-01-23 : Aska Yang donated a " Love" necklace for the 【Go! Love】 Celebrity Auction event. His necklace raised NT$120,900. 2009-07-27～2009-08-05 : Taiwan Red Cross fundraiser for low-income children~ Aska Yang’s hand print signature card raised NT$147,532. 2009-08-15～2009-08-16 : Taiwan World’s Vision Foundation~ 20th annual Hunger 30hours Fundraiser Event ~ Aska Yang and his fans club donated NT $500,000. ^ 2007年度十大新聞人物 第二名楊宗緯 (in Chinese). Yahoo News. 2007-11-22. Archived from the original on 2011-05-27. ^ "Who's Who' mentions 3,500 Taiwan celebrities". The China Post. 2007-08-21. ^ "Tennis star, singer make Taiwan's Who's Who list". Taipei Times. 2007-08-21. ^ 婦援會居中協調～楊宗緯與許安進達成和解　簽訂新約！ (in Chinese). ETtoday. 2007-11-05. ^ "Jam Hsiao and Aska Yang defeat Yoga Lin on G-music billboard". Yahoo!Singapore News. 2009-01-27. Archived from the original on January 31, 2009. ^ "Fans simply love rugged Aska". The Star Online. 2008-04-03. ^ "2014 NTCH NEW CREATION Crystal Boys". National Theatre & Concert Hall in Taiwan. 2014-02-07. ^ (in Chinese) Legacy Taipei Aska's PURE Live Concert Archived September 20, 2011, at the Wayback Machine 26 Aug. 2011. ^ 這一天，孩子不哭 - 楊宗緯的老師夢 (in Chinese). 張老師月刊. 2008-05-26. Archived from the original on 2011-07-21. Wikimedia Commons has media related to Aska Yang. This page was last edited on 3 February 2019, at 03:08 (UTC).